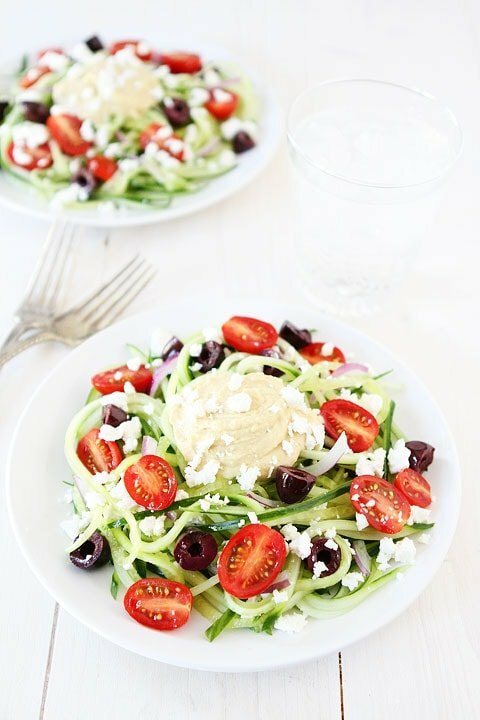 Greek Cucumber Noodles-this gluten-free noodle dish is one of our favorite summer meals! It is fresh, healthy, and simple to make! Are you feeling HOT, HOT, HOT? Summer is in full swing and it is sweltering outside. That means most of us are avoiding the stove and oven. Who wants to cook when it is roasting outside? Not me! 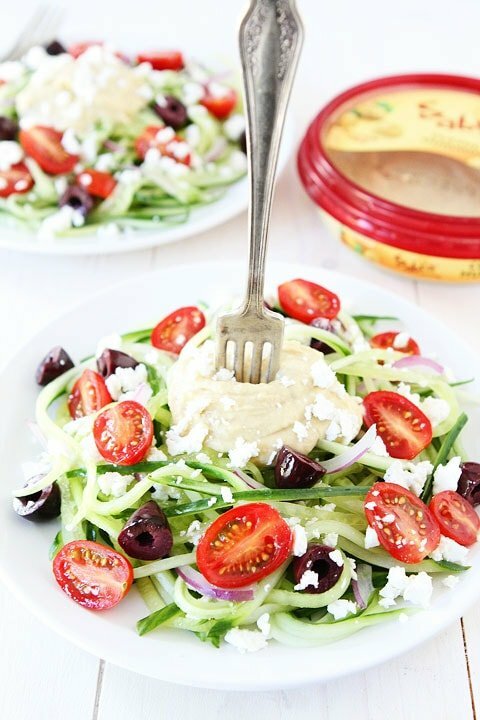 Well, today we are sharing our favorite no-cook summer meal, Greek Cucumber Noodles. You don’t have to turn on the stove or oven and it only takes about 15 minutes to make! Plus, it is healthy and OH SO GOOD! I love making cucumber noodles. Ok, confession, I rarely make them, Josh always does:) He uses our Inspiralizer. If you don’t have a spiralizer, you can use a mandoline or a julienne peeler. 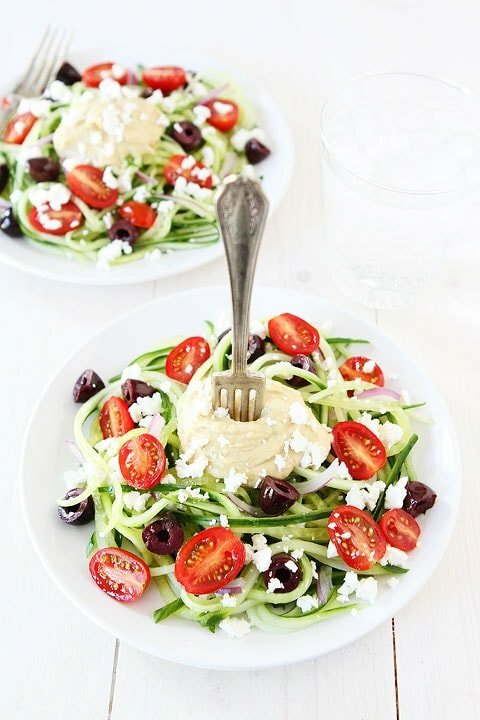 We top the cucumber noodles with all of our favorite Greek toppings: tomatoes, kalamata olives, feta cheese, red onion, and Sabra hummus. So it’s basically a Greek salad but in noodle form. You get all of the great Greek flavors in a fun, gluten-free noodle dish! 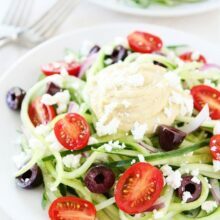 I could seriously eat Greek Cucumber Noodles every day for the rest of the summer. I just might! You can’t go wrong with quick, easy, healthy, and delicious! Plus, it’s a pretty noodle dish and you don’t have to heat up the house. This is a winning summer recipe all around. We hope you enjoy it as much as we do! And make sure you “Like Sabra on Facebook” for other tasty hummus recipes! 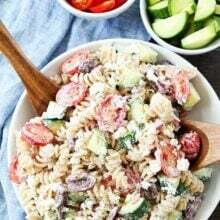 If you like Greek Salad, you will love this noodle dish! It has all of the same flavors, but in fun noodle form. 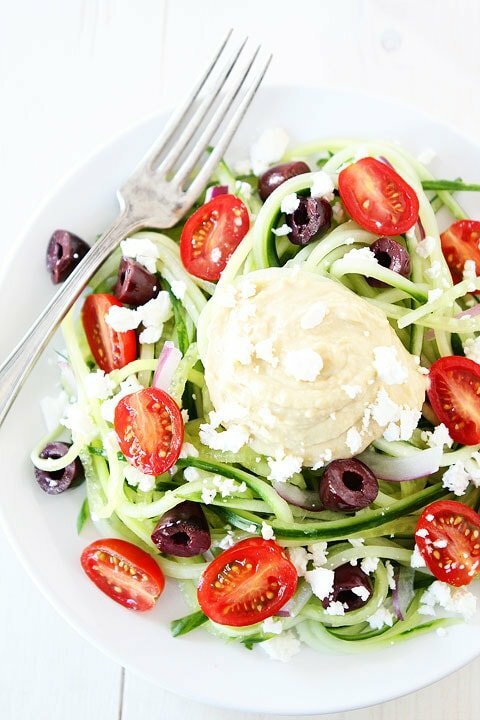 We love this quick, easy, and healthy cucumber noodle dish. 1. Use the Inspiralizer to make the cucumber noodles. If you don't have an Inspiralizer, you can use a mandoline or a julienne peeler to make the noodles. 2. Divide the cucumber noodles onto plates. Top with tomatoes, olives, and red onion. In the center of the noodles add a spoonful of hummus. Sprinkle feta cheese over the noodles. Season with salt and black pepper, to taste. Serve immediately. Disclosure-this post is in partnership with Sabra Dipping Co, LLC, but our opinions are our own. Definitely a perfect summer dish! Anything topped with hummus is okay in my book. yum! I can not wait to try this!! All of my favorite things! 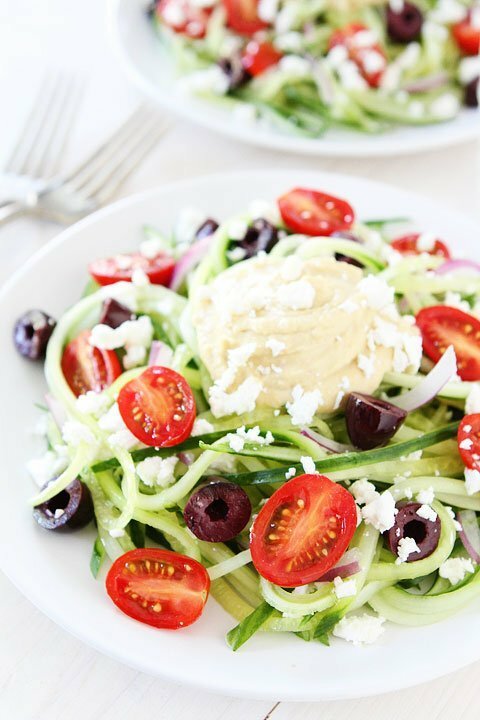 Cucumbers taste so different (so delicious) when they are spiralized!! I cant believe the different “cut” can make! 🙂 Thank you! Cucumbers and tomatoes are my faves! Love em 🙂 pinned! I love the idea of cucumber noodles. Combining them with greek flavors…yum! Unfortunately it’s been a pretty rainy and cool summer here in Buffalo. Don’t worry that doesn’t mean this cool noodle dish won’t still be a hit. We can use our fresh cucumbers and tomatoes right from our garden. 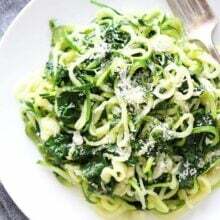 I am in a spiralizing frenzie lately – this is getting added to the menu! All my favorites in here. I could eat this every day of my life. Looks delicious! I’ve never made my own veggie noodles, but it’s a great idea I need to try soon! This is full on BRILLIANT!!!! I love this so much Maria- going on the menu! Sounds delish! It seems sometimes the dishes you & Josh cook up, I have made my own version of them…never knew what to call them … just my concoction! Haha! Keep you & baby in my prayers. Waiting!! A great choice for summer–light and refreshing! 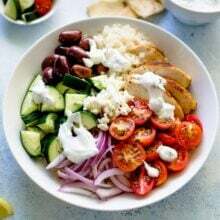 I love this play on the Greek salad — so creative and it looks so delicious! I need a spiralizer too but my hubby loves using the mandolin so this is a must make! I have a whole bunch of really good cucumbers in the fridge needing to be used! Congratulations on the new little pea! Goodness, this would be so fun to eat and make! Loving this salad! It looks amazing! That does it, I need to get a spiralizer. I’m seeing more and more great recipes using vegetables in place of noodles. I made this cucumber salad tonight. I cut the cucumbers in slices and in half. I used green olives of the kalamata olives. I didn’t have any feta cheese, so I used parmesan cheese instead. I added turkey deli meat to the salad. I used my red pepper hummus I had in the fridge. The salad tasted great! Thanks for the idea! 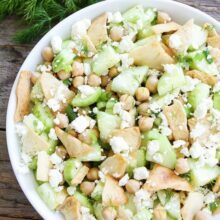 Pingback: 7 EASY Gluten Free Recipes To Help You Stay Healthy!